The Supreme Court nominee's letter affirming his decision to appear at Monday's Senate Judiciary Committee hearing came hours after an attorney for his accuser said her attendance that day was "not possible." WASHINGTON — Supreme Court nominee Brett Kavanaugh on Thursday reiterated his determination to appear at a Senate Judiciary Committee hearing next week "so that I can clear my name." Kavanaugh's statement came shortly after a lawyer for Christine Blasey Ford, the woman who has accused him of sexual assault, said that she was prepared to testify next week but that her appearance at the Monday hearing was "not possible." "Thank you for the invitation to appear before the Senate Committee on the Judiciary on Monday, September 24. I will be there. I look forward to the opportunity to testify before the Committee," Kavanaugh said. "I continue to want a hearing as soon as possible, so that I can clear my name." Ford, who has accused Kavanaugh of assaulting her when they were in high school, “wishes to testify” before the Senate Judiciary Committee next week “provided that we can agree on terms that are fair and which ensure her safety,” her lawyer said Thursday — adding that a Monday appearance is "not possible." On Thursday evening, Taylor Foy, spokesman for Judiciary Committee chairman Chuck Grassley, R-Iowa, said Grassley’s staff had spoken by phone with Ford’s attorneys during the day about receiving her testimony. Ford is being advised by Ricki Seidman, a communications strategist with Democratic ties, NBC News confirmed Thursday. Seidman served as former Vice President Joe Biden’s communications director during the 2008 general election campaign, as the deputy communications director and war room director for Bill Clinton's 1992 presidential campaign, and in the executive office of the president for Clinton from 1993-1994. Her office confirmed the news, which was first reported by POLITICO. Sen. Patrick Leahy, D-Vt., a senior member on the committee, led a group of his fellow Democrats in writing a letter to the FBI Thursday asking that the bureau take immediate action and investigate federal crimes being committed against Ford. “We are increasingly concerned by reports of alleged death threats against her, the hacking of her email, and the harassment and intimidation [Dr. Blasey Ford] has faced since being forced into the spotlight late last week," they wrote. Grassley had scheduled a hearing for Monday in which his committee would hear from both Ford and Kavanaugh. Ford’s willingness to testify under certain conditions comes after a stalemate that lasted several days between her and her lawyers and Republicans on the committee, who said that an FBI investigation into allegations she’s made against Kavanaugh isn’t unnecessary. Democrats have also said Republicans should allow the panel to call additional witnesses beyond only Ford and Kavanaugh. According to Grassley spokesman George Hartmann, the committee has also reached out to Cristina Miranda who posted on Facebook that she had heard about the incident while in school with Ford, but has has since said she actually has no knowledge of the incident. Miranda declined to talk to the committee, according to the aide. The panel has also interacted with an attorney for an unnamed person that's included in Ford's original letter, but whose name was redacted, but the committee hasn't received a formal response yet. Republicans have started searching for an outside lawyer to hire to handle questioning of Kavanaugh and Ford, ideally a qualified woman litigator, two sources told NBC News. The goal is to try and “turn down the heat” and make the hearing less political and emotional, one of the sources said. They’ve settled on the strategy, but haven’t yet selected the person to do it. The move would help avoid the difficult optics of having 11 male senators questioning a female witness on a sensitive topic — a situation that backfired politically during the Anita Hill hearings, when every member of the committee was a man. Democrats aren’t able to block Republicans from handling the hearing this way if they choose, a Democratic committee aide said. Kavanaugh, meanwhile, was back at the White House complex on Thursday, amid a week of visits that have included preparation for the possibility of additional Senate testimony, according to a person involved in the confirmation process. In a private session Tuesday, Kavanaugh was grilled by a small group of White House staff about his past, his dating life and the account his accuser, Christine Blasey Ford, has given about events from the early 1980s. Among the White House staffers participating were White House counsel Don McGahn, communications director Bill Shine, press secretary Sarah Sanders and deputy press secretary Raj Shah. The source said that Kavanaugh, who returned to the White House for a third consecutive day Thursday, is "determined and hopeful," and that it's up to him how he'd like to present himself on Monday if the Judiciary Committee moves forward with its scheduled hearing. Attorney Beth Wilkinson is also helping Kavanaugh prepare for the possibility of testifying again. 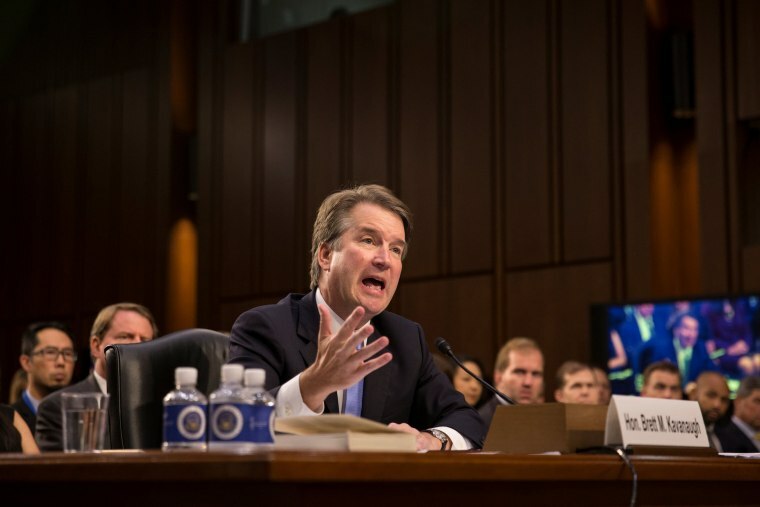 Wilkinson, a partner at Wilkinson Walsh Eskovitz in Washington, is an experienced trial lawyer and, ironically, a close friend of Judge Merrick Garland, whose nomination by President Obama to the high court was blocked by Senate Republicans. The law firm and Wilkinson both declined to comment on the record. "He has to make those decisions how he wants to tell his story," the source said. "It's really in the nominee's hands. It's his reputation and he knows all the facts." Separately, a Republican Senate aide who has been briefed on Kavanaugh’s preparations said the practice sessions “have been going well,” adding that he’s been spending his days as if a hearing will go forward on Monday. As Kavanaugh prepares and Senate Republicans renew their push to move forward with the confirmation process, the judge’s opponents looked to outside pressure Thursday to do what institutional tools have not. Protesters descended on Capitol Hill on Thursday morning even though most lawmakers were back in their districts for the rest of the week, with led to 56 arrests. Dozens arrived at Senate office buildings to protest Kavanaugh’s nomination, including a group of women wearing pins reading “I believe Christine Blasey Ford” and who recounted their own experiences involving sexual harassment and assault. Ford has accused Kavanaugh of sexually assaulting her while they were in high school in Maryland during the early 1980s, and Republicans on the Senate Judiciary Committee have set a deadline of Friday morning for her to decide whether to testify about the experience at a public hearing on Monday. Meanwhile, more than 1,000 alumnae who graduated from Ford’s high school, Holton-Arms School, from the 1940s to more recently signed a short letter in support of her. “We believe Dr. Blasey Ford and are grateful that she came forward to tell her story. It demands a thorough and independent investigation before the Senate can reasonably vote on Brett Kavanaugh's nomination to a lifetime seat on the nation's highest court,” they write. The protests come as Republicans press forward with the process to confirm Kavanaugh. Mike Davis, chief counsel for nominations on the Senate Judiciary Committee, drew scrutiny Wednesday for posting and then deleting tweets saying he had personally questioned Kavanaugh and referring derisively to Ford's legal team — and indicating that, despite his current role in the investigation, he backed the nominee's confirmation. “I’m still waiting to hear back from the accuser’s attorneys, who can’t find time between TV appearances to get back to me,” he said. “Unfazed and determined. We will confirm Judge Kavanaugh. #ConfirmKavanaugh #SCOTUS”. Davis tweeted Thursday that he had deleted the comments. Democrats and Ford are pushing for the FBI to investigate the allegations against Kavanaugh before holding another hearing, while Republicans are arguing that such a probe isn’t necessary and President Trump, who would have to direct the FBI to conduct such an investigation, has said he has no plans to do so. A group of Democratic senators, all former prosecutors or state attorneys general, sent a letter to the White House on Thursday arguing for the need for an FBI background check investigation. “Declining to have the FBI take action under these circumstances also abandons the precedent that President George H.W. Bush set when he asked the FBI to investigate after Anita Hill raised allegations against Judge Clarence Thomas in 1991,” they wrote. The letter was signed by Sens. Amy Klobuchar of Minnesota; Kamala Harris of California; Patrick Leahy of Vermont; Sheldon Whitehouse of Rhode Island; Richard Blumenthal on Connecticut; Doug Jones of Alabama; Tom Udall of New Mexico; and Catherine Cortez Masto of Nevada. Leigh Ann Caldwell, Frank Thorp V and Marianna Sotomayor contributed.